EnergyNet hosts a platform for government agencies to conduct online lease sales. Government lease sale listings and parcel information are available to the public without the need to login. To register for a sale and place bids, the user must complete the buyer registration process, submit banking information, and agree to the Lessee's Agreement to Lease Minerals. Additionally, each individual sale will have specific terms and conditions which must be acknowledged during registration, such as the lease form governing the parcel to be leased. Register as a Buyer now. The Buyer registration process will only require a few minutes. After submission of registration information, the user will be immediately logged into the new account and be able to submit banking information and request a bid allowance. When registering a Buyer account, the user may choose between a full EnergyNet Buyer account or a Government Listings Only Buyer account. 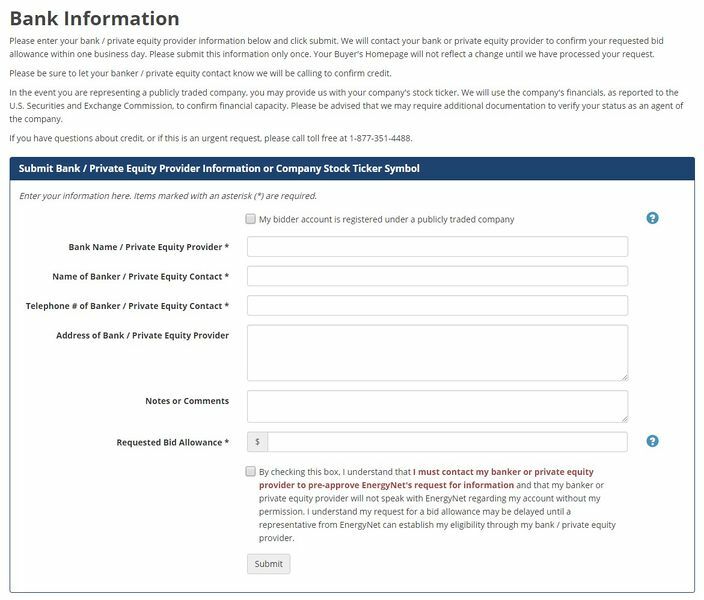 A full Buyer account allows the user to participate in all sales on the EnergyNet platform and requires that the user meet and agree to certain SEC and FINRA guidelines. A Government Listings Only Buyer account may only participate in government lease sales, although the account can easily be upgraded to a full Buyer account at any time. There is no cost for either type of Buyer account. 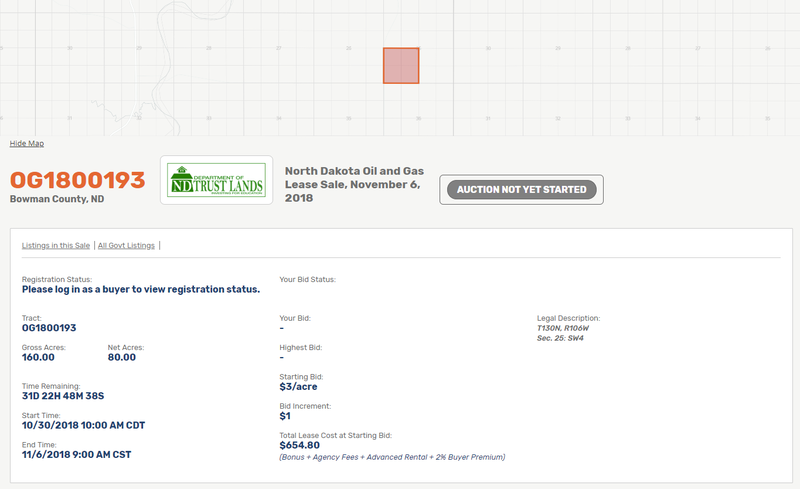 When choosing a Buyer ID (Username), keep in mind that, depending on the type of asset on which you are bidding, other users on the EnergyNet.com website may see the Buyer ID in the Bid History table after bids have been placed. Choose a Buyer ID (Username) and a strong password to protect the account. Tips on setting a secure password: A strong password is at least 8 characters long. Avoid using words that can be found in a dictionary, as these types of passwords are less secure. To add security, consider using both upper and lowercase letters, numbers and special characters including "! $ &" etc. After completing the registration for Government Listings Only, complete the Lessee's Agreement to Lease Minerals (read a copy here), then submit bank information to establish a bid allowance. The bid allowance is confidential. The bid allowance is per parcel. To establish a new bid allowance, or increase the existing bid allowance, the request must be made through the EnergyNet website from the Buyer's Homepage. EnergyNet cannot process bid allowance requests over the phone. Prior to placing the bid allowance request, contact the user's banker or creditor with whom EnergyNet will qualify the bid allowance. Authorization to speak with an EnergyNet representative will be required for the banker or creditor and skipping this step will greatly increase the amount of time required to process the bid allowance request. If the bidding company is publicly traded, please provide the ticker symbol. No additional banker or creditor information will be required. After completing the buyer registration process and providing the necessary bank information to establish a bid allowance, the user will be notified via email by EnergyNet confirming the account is approved to place bids. The Bid Allowance will also be displayed on the Buyerâ€™s Homepage. In the event of a possible desired increase, please make the request from the users Buyer's Homepage as soon as possible. Be sure increasing the bid allowance is not a step you will need to take during active bidding times. Any requests made the day of a sale will be processed as quickly as possible; however, EnergyNet cannot guarantee processing with sufficient time to place bids. The Buyer's Homepage allows the user to review the status of the "Lessee's Agreement" and view the bid allowance or request an increase. When bidding on a parcel, bids are entered as a Maximum Bid. Upon entering a bid amount, the Bid Calculator will display the total cost for the lease. Auctions vary and bids may be per acre, or total bonus; check bid amounts accordingly as a submitted bid is binding. By placing a Maximum Bid (Proxy), the user is asking the EnergyNet auction engine to bid automatically on their behalf, up to the amount specified. The system will place bids at the minimum amount necessary, one bid increment at a time to maintain the bidder's status as the high bidder. For example, on a parcel with a current high bid of $100/acre and a bid increment of $1, if the user enters a Maximum Bid of $200/acre, a new bid will be placed automatically at $101, the next minimum increment, to make the user the new high bidder. The system will then continue to increase the user's bid whenever they are outbid. If another bidder submits a bid of $150, the user becomes the high bidder at $151. The system will only bid up to, and including, the $200/acre limit specified. The Maximum Bid mechanism is an invaluable tool to maintain a bidding status because it operates automatically, based on the parameters set by the user. The user does not have to be active during the auction to participate and will not need to manually place additional bids. This feature can be very important when bids begin to increase faster than a human can respond manually. After the user has set a Maximum Bid amount, the user does not have to be online during the rest of the auction. This is especially useful when the user must be away from a computer during the auction or will not have access to the Internet at times while the auction is in progress. The user does not have to be online or logged in for the system to bid on their behalf. A user's Maximum Bid is confidential. A user's Maximum Bid will not be shared outside of EnergyNet. Other bidders never see a user's Maximum Bid. The Maximum Bid protects users from paying more than is required to win. It is only used to bid the minimum amount necessary to win against competing bids. Bid information is updated across the EnergyNet site instantly, but the web browser must be "refreshed" to see current results as time passes. The browser will not automatically refresh the bid history tables, auction status, or other events. The information viewable is only as current as the last time the page was loaded or refreshed. For instance, on a tract information page within the bid history table, only the bids that were entered on or before the moment the page loaded in the web browser will be viewable. To see if new bids have been entered, a page refresh is required. Modern web browsers may be refreshed by pressing the F5 key on the keyboard while viewing the browser page. The individual browser may also have a "refresh" or "reload" button at the top of the page. When bidding on a sealed bid parcel, enter the bid amount to display the Total Lease Cost calculation amount. To submit the bid, the user must enter a password as prompted. A green banner will appear confirming the receipt of the sealed bid. An email will be sent to the email address on file to confirm the bid has been accepted, however, no amounts will be listed in the email. It is recommended to take a screen shot of the page once the bid has been placed. The sealed bid will not otherwise be visible as activity in the user's account, as sealed bids are encrypted. A user may outbid themselves, if multiple bids are submitted. Bids may not be withdrawn, retracted, or reduced. Government leases currently available for auction can be found on the Government Listings page. Government Listings are divided into sale groups. Each sale group contains one or more parcels from a specific agency. All parcels within a sale group open for due diligence at the same time. Auction parcels open for bidding one at a time, in set intervals (1, 2, 3, or 5-minute increments). Parcels are available for bidding for a set period of time, then begin closing in , 2, 3, or 5-minute intervals until the last parcel is closed. The opening and closing dates and times for bidding are always available on the Government Listings site. Sealed bid parcels open for bidding at the same time, and close at the same time. The opening and closing dates and times for bidding are always available on the Government Listings site. When accessing the Government Listings page, a map of the United States featuring all currently available parcel is displayed. Use the mouse wheel to zoom in on the map and view the parcels. Turn on satellite imagery to see roads or other land features near a parcel of interest. Below the map, each active individual sale group is listed. Each sale group has an opening and closing time and a Register for Sale and View Listings button. 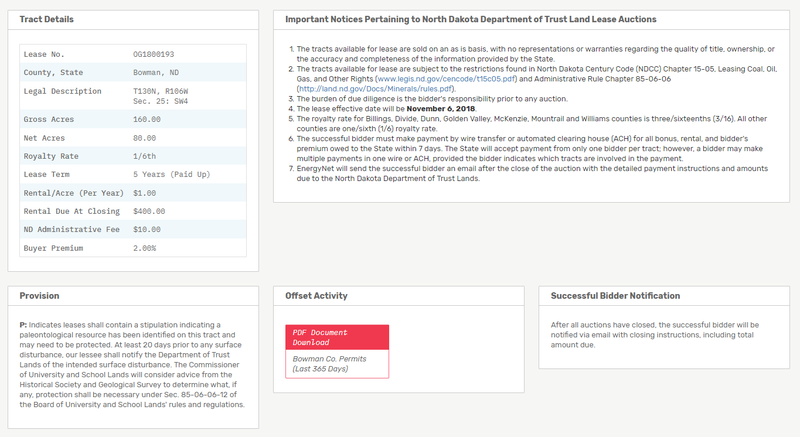 Every parcel available for lease in the Government Listings section has an individual "Tract Information Page" that contains specific data about the parcel. There are four requirements a user must meet prior to placing a bid on a Government Listings parcel. 1. Have a valid and active Buyer account. If the user does not yet have a Buyer's account, follow the registration process instructions to create one. 2. Agree to the Lessee's Agreement. After the user creates a Buyer account and logs into the site, the Lessee's Agreement may be accessed from the Buyer's Homepage at any time. 3. Have an adequate bid allowance for the parcel(s) of interest. Depending on the government agency, parcels may be bid on per acre or total bonus. When entering a bid, the total cost of the lease is calculated and displayed. This cost includes all the fees involved in the transaction and cannot be greater than the bid allowance. 4. User must also register for the individual sale, accepting the terms and conditions. For each individual sale, the user will be assigned a Bidder ID #, unique to each sale. Other bidders will only see the Bidder ID#.